There are a number of options that you can go through before you jump into pool construction. Everything from shape, size, depth, and most importantly, surface finish can be customized as you wish. 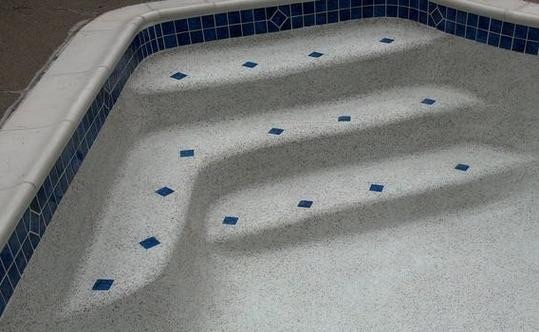 Plaster is a popular choice as it gives pools a nice smooth and easy on the skin finish. Pool plaster is a mix of white cement, marble aggregates and water. It also makes the pool look good while being cost effective. 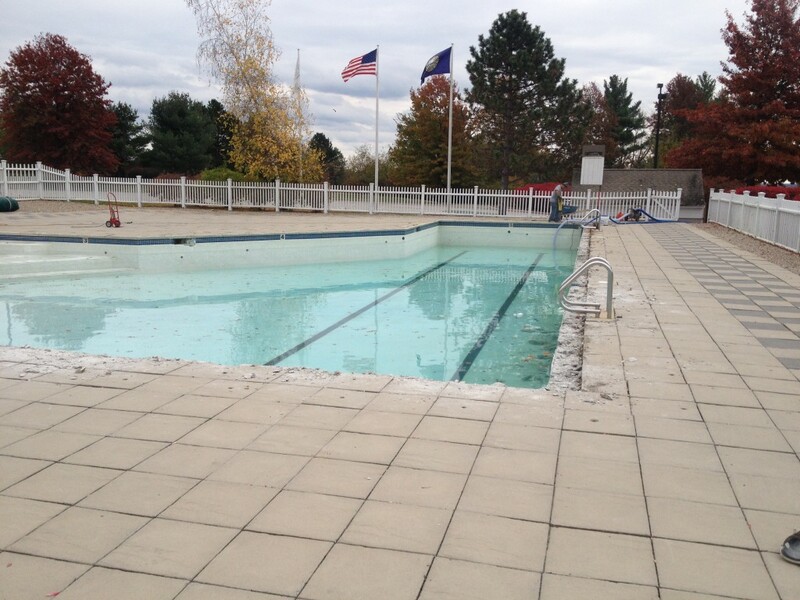 In fact, building codes dictate that in most public pools, the surface has to be plastered. Pools are a great extension to any home, be it deck level, above ground or ground level. They can be made to reflect the decor and become an integral part of any home. Conversely, the pool area can be its own separate space and can have its own motif. If you already have a pool and are looking at remodeling, this could be the guide for you to select a particular style or make a combination of different styles to create your own, personalized space. There is a lot more to swimming pools than just plain blue tiles. Here are a number of design suggestions that you can think about. If your pool is looking bleak, with broken tiles and too much dirt between the grout or just generally old and worn, it may be time to think of a remodeling. Firstly, unlike many other projects in your home, pool renovation is not something that can be done by yourself. Do not even attempt a DIY pool remodeling, it’s just not worth the time and effort, this one is best left to the experts. Here are a few things to keep in mind before calling in the contractors to remodel your pool. Whether you are installing a swimming pool, renovating a swimming pool or remodeling your swimming pool it’s a major life event during the course of the project. The entire process, from the initiaml concept to picking out patio furniture, can be filled with many decisions. None are more crucial or challenging than selecting the perfect pool finish for your Gunite pool. Water is clear, so your interior pool finish is the major factor that will create the color you want your pool to be. Whether it’s island water colors or a traditional blue pool water, the pool plaster finish is a major factor to the water color. Before making such a big decision, take the time to look at all of the conditions and aspects of your pool setting. Here are Five Things To Consider When Choosing Your Pool Color that should help you make the right choice for your ideal paradise! 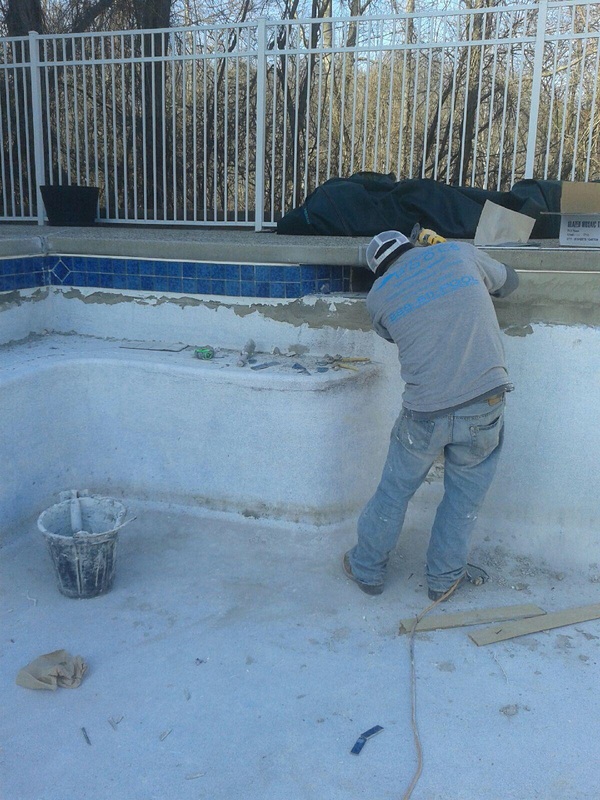 The Installation of the Pool Plaster and the type of pool plaster final finish can be determined by the Pool Plaster Installer. The way the installer mixes and finished the plaster can ultimately determine the final finish of the plaster as well as the longevity of the plaster. 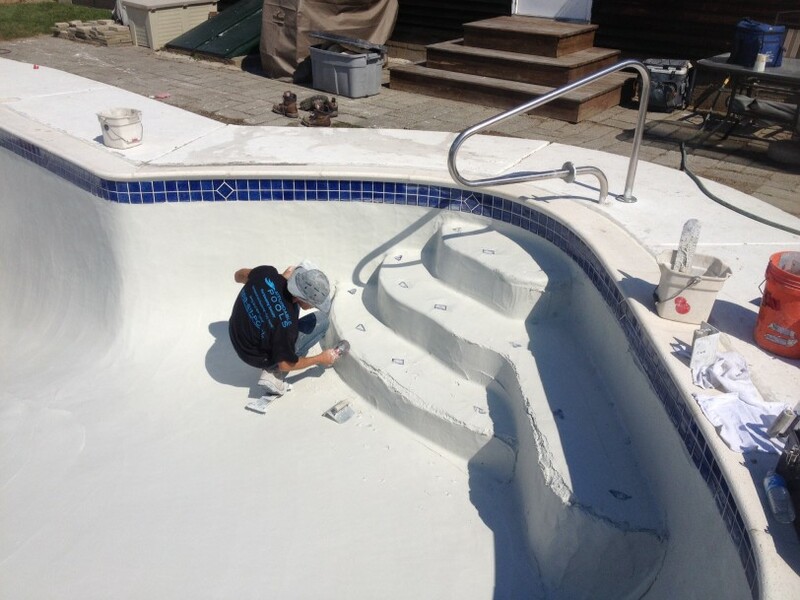 If for example the mix of the pool plaster has too much calcium added, (the calcium is added to speed up the finishing time which some installers prefer in order to plaster two or three pools a day per crew), it will generally create a darker off white plaster in a white marble mix plaster for example. To check out what types of plaster are available click here. Repairing pool tile on your gunite swimming pool can be overwhelming, but if you need only a few pieces of tile patched, then this is a DIY kind of project. If half or more of your tile needs to be replaced it may be wise to have a professional pool tile installer install your new pool tile (we will get to this further down in this article). 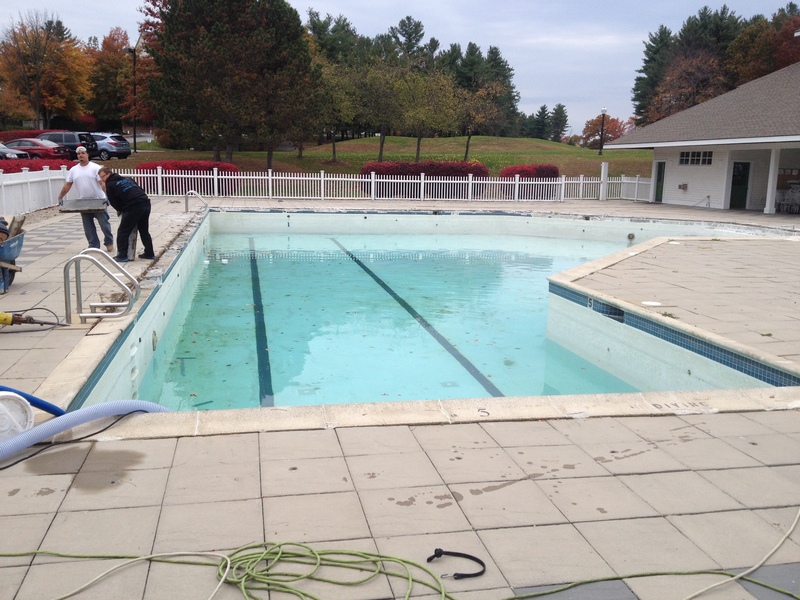 Affordable is currently renovating the gunite pool at Skymeadow Country Club off of Spit Brook Rd in Nashua NH. We started off last fall installing all new Pool Coping Stones and new Frost proof Pool Tile. 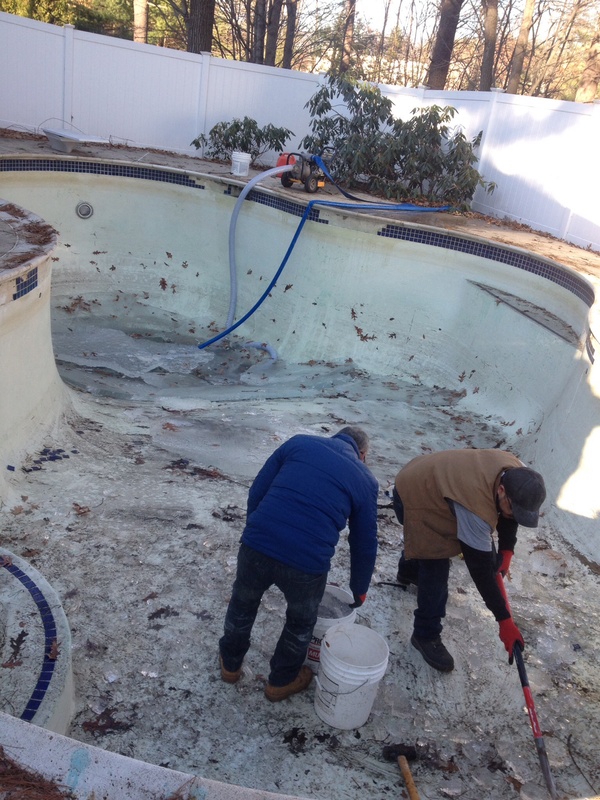 At that time we also started prepping and preparing the interior of the gunite to have the new Diamond Brite Cool Blue Pool Plaster Finish installed come spring time. Well now that spring has arrived, Affordable Pools is trying to get every little detail finished to perfection in order to have this commercial pool up and running for Memorial Day. This is the type of Pool Work Affordable Pools is known for. 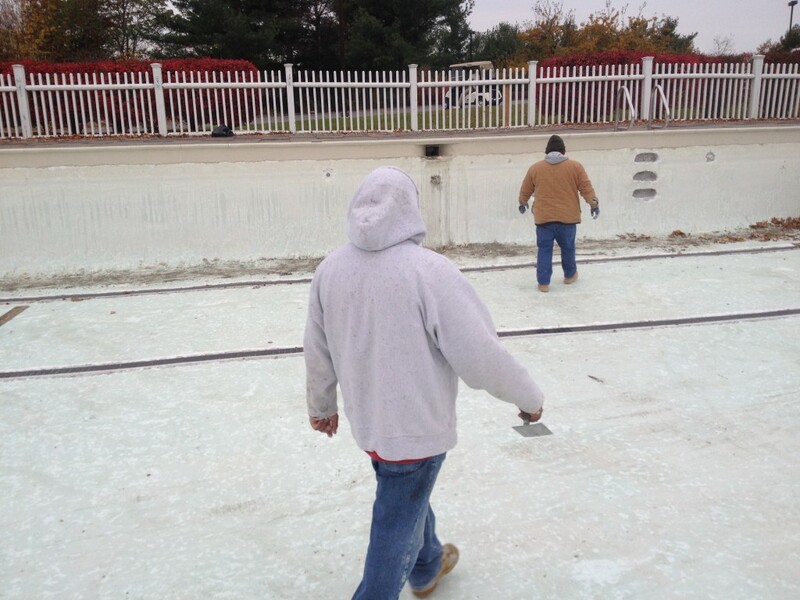 Renovating a gunite swimming pool in Nashua New Hampshire with ice still in pool Affordable Pools. We started to renovate pool in Nashua New Hampshire and there was still 6″ to 8″ inches of ice in the pool but we had to break up and haul out. Copyright 2017 © Affordable Pool Repair. All Rights Reserved.